I read a few years ago that making and of course eating lentil soup on new year’s eve is thought, in Italy, to bring health and good fortune. While I’m not Italian, I do love the food and traditions. With the weather in New England being quite cold lately I figured “why not?’, it’s healthy, hearty and warming! Heat a medium stockpot over medium-high heat. Add the olive oil to lightly coat the bottom of the pan. Add the onion, carrot, celery, and garlic. Cook until the onion has softened, about 2 minutes. 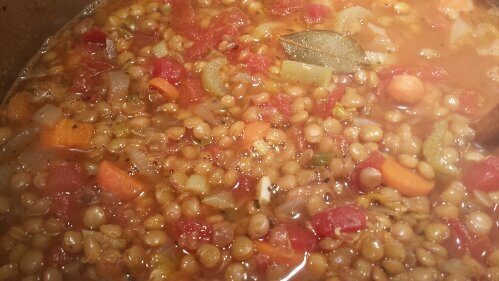 Stir in the lentils, tomatoes, stock, bay leaf, cayenne, chile powder, cumin, paprika, basil, salt, and pepper. Bring to a boil, reduce heat, and simmer until the lentils have softened, about 20 minutes. Remove the bay leaf before serving. Next Post Cool Your Joints!